This quest started back in November when I ordered a 'smoke pipe' along with a book through a website called allforchefs.com. After quite a bit of time and unsuccessful attempts at contacting the company (which is based in Spain), I never received the products. I order frequently from the internet, and this was the single most frustrating experience for me... especially since the money was removed from my bank account the very next day. I never did receive the book or my money back(which was about 75USD), but eventually did receive the smoke pipe. The pipe was advertised as a Joan Roca creation. It was a battery-powered device that was capable of shooting a stream of smoke onto food or under a cover to create a nice table experience. The price of this device was about 80USD including the shipping from Spain. The downside (besides being overpriced) is that it was made so cheaply it never worked at all. The only thing preventing me from throwing it away was the ridiculous price I paid for it. Aside from all of that and my gripes against ALLFORCHEFS.COM (never buy from this site!!! ), I decided to build my own after seeing how easy the device was to assemble. You will need to purchase the items below, which cost me about $30 all together (much cheaper). They are 1) a battery-powered mini vacuum used to clean dust from computers and electronics (I paid $20 for this through this site. 2) a battery for the device. 3) a bowl for a pipe (which can be bought at any small local head shop. 4) screens for the bowl (also at the head shop). 5) a super adhesive or glue. 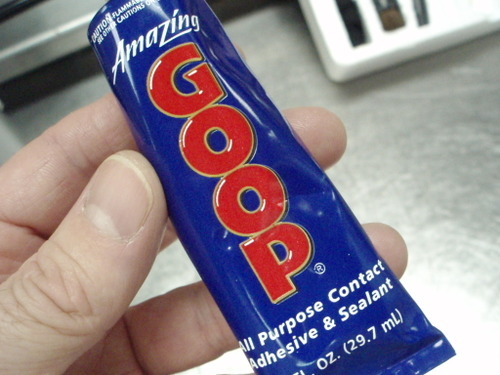 I used Amazing Goop for the fusing because it says it can glue anything to anything. 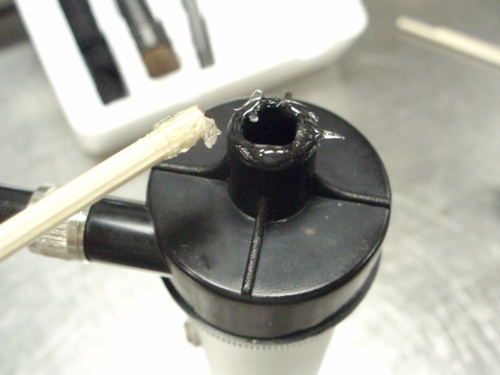 Another note is to read the temperature handling capability of the adhesive. The metal bowl will be pretty hot during use. 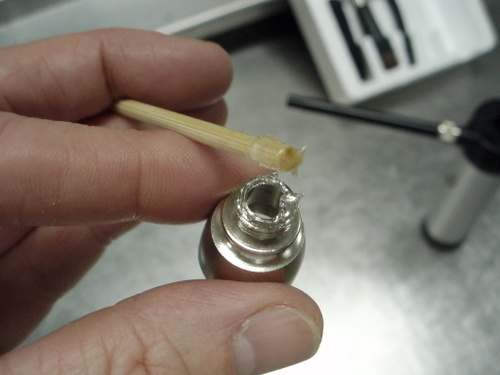 Using some type of applicator (like the bamboo skewer below), put a little adhesive on the ring of the bowl (careful not to get any in the way of the middle opening). Next, apply adhesive to the rim of the mini vacuum (usually the top) where the air intake is located (just look for the part that actually functions as the vacuum). Carefully fuse the bowl onto the vacuum, press tightly and let the adhesive dry for the required time on the package. Double check the opening through the bowl to make sure no glue is clogging the air flow. 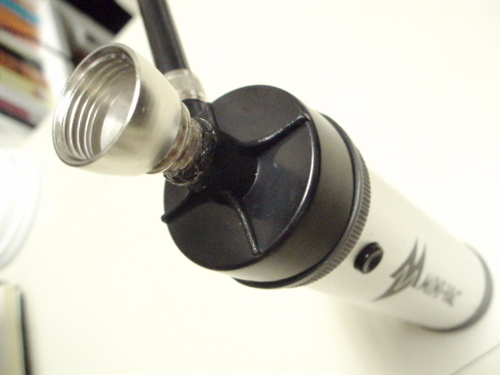 Use one of the attachment tubes and place it onto the air output (where the air exhaust from the vacuum is located). 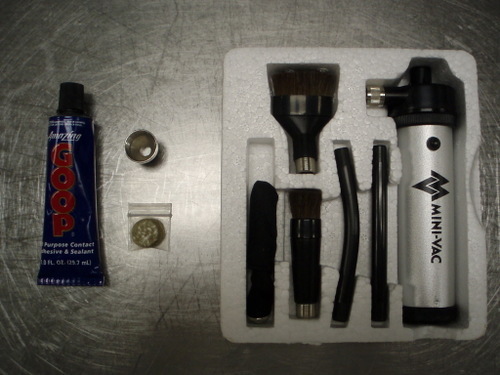 Most mini-vac's come with multiple attachments and brushes... you will only need a tube that is about 3 inches long to direct the smoke through. Once the glue is set, you can use the pipe. I use small hickory chips (ground into small shavings with my spice grinder) and place them in the metal bowl. Be sure to use one of the screens inside to prevent larger particles from going through the machine. To operate, just aim the tube where you want the smoke (I stuck it under a glass on a plate to create the effect below), and turn on the fan, and light the wood. 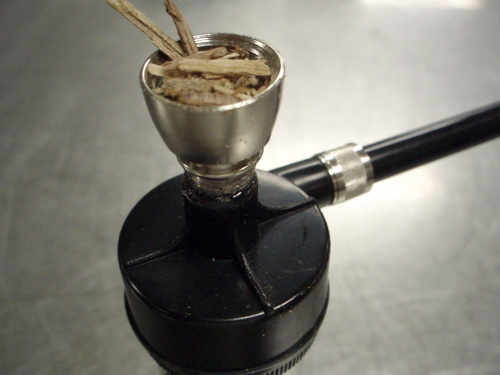 After the initial ignition of the chips, the bowl should stay lit by itself. A steady full stream of smoke will shoot out of the tube. This is the intended effect. Place food on a plate. 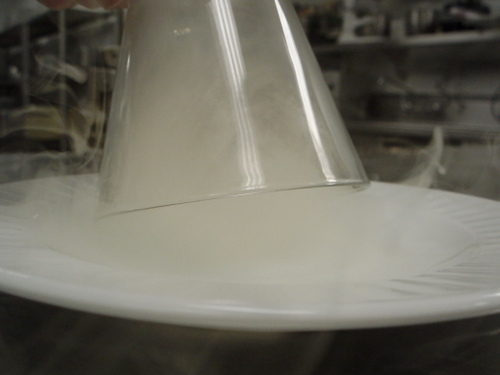 Cover the food with an inverted glass or dome. Fill the glass with smoke, remove the pipe tube, and set the glass firmly down. When the plate arrives at the table and the glass is removed, a cloud of intense hickory (or tea, or nut shells, or whatever else you want to burn for smoke) will pour out around the plate before dissipating into the air. Very simple but not worth all of the drama necessary for me to learn how to create it. Now, everyone can build a smoke pipe like mine! Do not spend unneccesary money on junk from Spain that does not work! Do not buy anything from ALLFORCHEFS.COM!!! Just go to the link above, order the vacuum. Buy a battery and the other components while waiting for the vacuum to arrive, then put it together yourself... imagine your sense of self-accomplishment and the unwasted money in your pocket!